Note: Geelong Lawn have withdrawn their Section 10 team. Their position at No. 8 will now be a bye. The results of matches played by Geelong Lawn in the first two rounds will now be removed. NOTE: CHANGE OF COURT LOCATION. 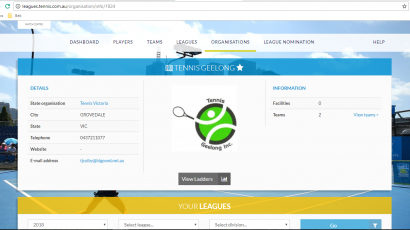 SURFCOAST matches at Jan Juc courts will be relocated to Anglesea Tennis Club courts (Cameron Rd, Anglesea, next to bowling club) from Saturday 19th May through to the end of the season inclusively. Jan Juc courts are being resurfaced and new lighting installed. This is for Sections 12 blue , 12 white, 13 and 17.